Educational Institute Of Future Achievers Welcome to Educational Institute of “Future Achievers” “E.I.F.A.” is a ISO 9001:2008 Certified Institute, tackle all type of entrance Exams. In the today's world if you wanted to go any proffessional firm, you should be go with Entrance Exams. We have prepared a superb programme that will help you to fulfill your dream of becoming scholar as well as prepare you to face the challenges of the non-stop competitive world. Best Hotel Management Jee institute in Kalyan, Dombivili, Badlapur, Ulhasnagar, Thane district. 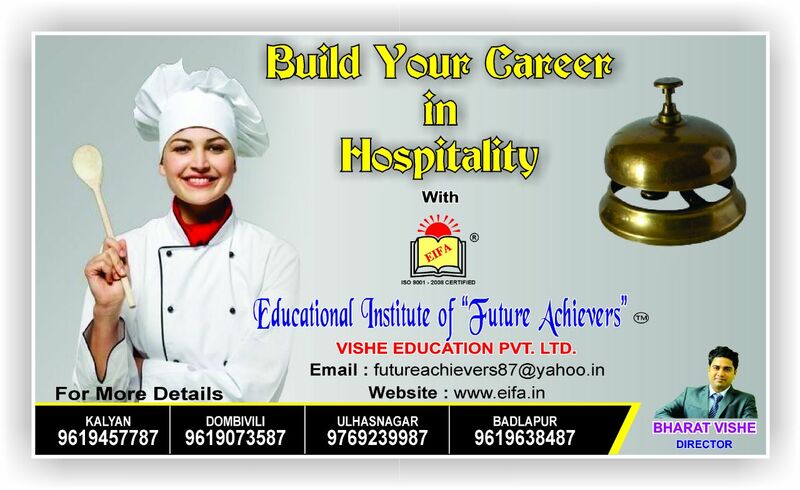 Educational Institute of "Future Achievers" is one of the Best institute for Hotel Management Jee course. Most of the students are confused to get decision what to do after 12th. This is the assured job guaranteed career option so don't waste your precious time and join Today. Hotel Management Courses in Kalyan. HOTEL MANAGEMENT Wanting to be settled in your professional life, calls for making a sound decision after your H.S.C. Opting for B.Sc. in Hospitality from EIFA will lead every candidate towards a lucrative career. It is a 3 year degree course with global recognition that will pose these openings for students: Railway Hospitality Services 5 stars & 7 stars Hotel Shipping & Cruise Lines Catering Services Airlines Indian Navy Hospitality Services Resort Management Services Hotel Business Industry COURSE SYLLABUS Fluent & Accent oriented English Communication Personality Development Foreign Languages Computer Knowledge BENEFITS AFTER COURSE COMPLETION Campus Recruitment assured with jobs worth Rs 20k to Rs 1 Lacs in IndiaStudents can opt for overseas job with pay packages worth 2.5-3 lacs.If you wish to pass HM-JEE exams for Hotel Management with flying colors, then EIFA is the institution you need to rely on for sound coaching. The Hospitality Industry awaits your contribution. Best Hotel Management Courses in Kalyan, Thane, Mumbai. Enter in the world of Hospitality Industry, Hospitality industry is the worldwide fastest growing & developing industry as well as India. A 3 years degree in Hotel Management prepares the student for immediate absorption in the world of Hospitality industry. MBA CET Courses Institute in Kalyan, Thane, Mumbai. MBA from a leading B. School is your Best chance to settle a career After 2 years. An MBA is an education based on insights into the fundamental concept of management & how to relate them to the broader international picture. An MBA Will indicate to your prospective employer that you have the Skills required to be successful in any business, you will be able to manage & lead teams, have time management skills etc. It not only creates an empact for those engaged in the commercial and industrial sector but across all professions. Best Career Option in Hotel Management.